This little boy Bengal kitten is just 8 weeks old so he will change quite a bit over the next few weeks! Right now he is in the middle of the fuzzy stage so his beautiful coat is masked by longer guard hairs. It will start to develop into his clear adult coat around 12 to 16 weeks of age. 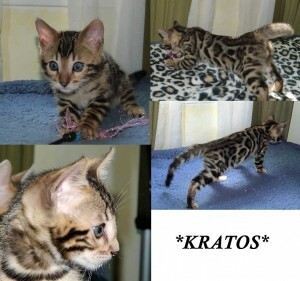 Kratos are currently available as breeder/show prospect. Please inquire with any questions you may have! Parents PK-def & HCM tested. This entry was posted in Bengal Kitten Gallery, Gallery and tagged available bengal kittens, Bengal, Bengal kitten, bengal kittens, brown rosetted, Brown rosetted bengal kitten, rosetted bengal cats, silver bengal, silver bengal cat, silver bengal kittens, Silver bengals. Bookmark the permalink.